Finding this picture inspired me to discuss the “guidelines” mentioned, to outline why each part is so important and what it means. 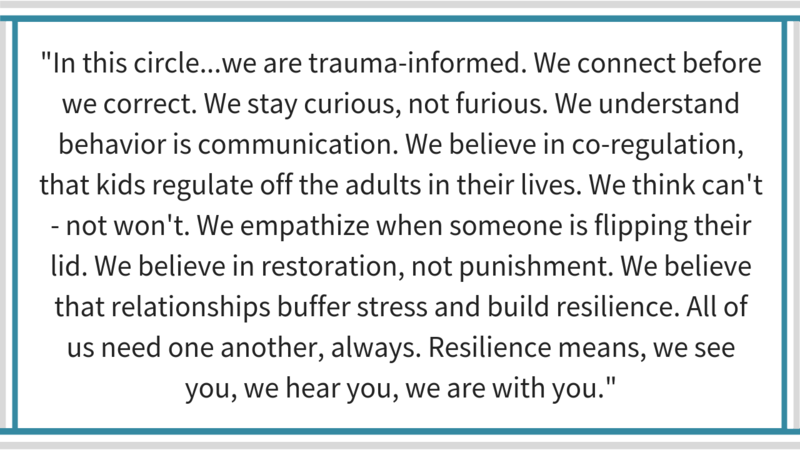 The truth each line provides is simple but profoundly important to safe, nurturing, and respectful relationships and communication and, ultimately, important for healing. Trauma-informed care means considering and remembering the context and story of the whole person, taking into consideration past trauma and the resulting coping mechanisms when attempting to understand behaviors to better support the person. In short, CARE about the person in front of you for all that they are, understanding and responding with kindness and respect. Understanding this concept helped me to deepen my connection in all my relationships, realizing that there is no such thing as bad behavior, just a breakdown in communication or a boundary that is being pushed. I am more likely to develop a trusting relationship by letting the person know that I care about them even if I don't agree with what they are saying or if I need to say “no” to a request. When I feel loved, valued, and understood, I am more likely to be open to suggestions or correction than when someone (my husband, for example) goes straight to correcting something about my behavior and I end up feeling judged. If he makes sure to let me know where he is coming from, asks if I want feedback, and most importantly honors my “no,” then I am prepared to hear what he has to say. If someone launches straight into critique, I am not interested in hearing more. It took us a while to learn this strategy but it has paid off in our marriage and our connections to our kids. I would highly recommend trying to incorporate this different kind of communication into your own relationships. If we are furious, we are often in a state of blame. Yes, feeling our feelings is important and anger is an important feeling to learn to express when we have been hurt. But even with powerful emotions like anger, you can stay in a curious mindset about the feeling by asking the question, “What do I need now?” I can wonder what I need to do or what kind of support I need to ask for to make the shift from angry back to calm and peace and gain clarity about what I am feeling. This is the tip of the iceberg of communication. What you see being acted out is the behavior, but what is underneath is an unmet need, frustration, hurt, and struggle. When children and adults act out (keep in mind that it is not always done consciously), there is an unmet need being expressed and the person is asking for help without their words. And though we want to encourage that person to communicate their feelings with words in the future, you can at least keep this in mind to view a person’s behavior as more complex than a seemingly simply incident of unwanted behavior. Co-regulation means that the emotions of an individual are continuously susceptible to being modified by the emotions of a partner or someone with an important role in your life, that two people regulate their own emotions based on the emotions of the other person. When the person in front of you is in fight/flight or freeze, they have lost access to the part of their brain that helps them to stay grounded and we respond to that. Think of a herd of animals. It just takes one of them to express fear or freeze up and the entire herd or pack responds in kind, assuming that something is wrong and they should be afraid as well. While most people find their way back into social engagement and are able to self-regulate, survivors of trauma have been living in fight/flight or freeze for years and often don't know that it is safe to come out of that. And it can be an endless cycle. We need other safe people in our lives to help us learn how to self-regulate. In the beginning stages of that process, we learn to heal through co-regulation. This means that you choose to believe that people would change if they knew how, that someone is struggling right now because they can’t change (for a reason), not because they won’t. I learned this in a powerful way when I was helping my son that struggled with reading. I made sure we practiced, learned the letters, learned the sounds, started with short words, etc. Every time I sat him down to practice, my son would resist and object. I would spend an hour trying to get him to sit down with me for just 10 minutes of reading. It was exhausting at times. Then I started to think about why it was so hard for him. I began to approach him and this challenging task with a few of the strategies already discussed above, to be curious, not furious, to make sure I was connecting with him before I was correcting him. No one likes to be reminded of the things they don't know how to do, a hard task they may feel embarrassed about. I knew my son was feeling inadequate because he noticed he was not reading at the same level as his peers. So I stopped approaching it as a task that needed to be completed, something I was trying to control, which made him embarrassed about something he was doing “wrong,” and we slowly figured out how to meet in the middle. Instead of forced time learning to read, it became a special time for us to connect, a time for him to communicate his frustrations and concerns and me sitting down with him to listen to everything HE had to say. I see now that this was the foundation for my son learning that I was on his side, that I trusted him, that I believed in him, that I was going to work with him on this for as long as it would take. It has facilitated the relationship that I have with him now, a deeply connected relationship, where he tells me almost everything (I say almost because he IS a teenager) He comes to me with things he is struggling with and we talk about how he can get better at it after some research and practice. And as a result, the same young boy who NEVER wanted to practice reading is now a teenager who isn’t afraid of trying new things. Meaning, we recognize the symptoms of trauma or overwhelm in someone and we don't judge, but send them love instead. It does not mean we let them dump their fear or anger on us. But with loving and firm communication, we make it clear that we are not going away, that we are here and willing to sit with them through the hard feelings until they feel calm enough to come up with an empowered plan of action and can communicate what they truly need. Feel empathy for people that are struggling. You’ll find that is just what they needed to feel better and begin to heal. Most people punish themselves more than we ever can. People don't need more punishment, they need kindness and opportunity to learn and grown. What most people have not experienced is an opportunity to restore the hurt, the relationship that needs tending to, which is also how we learn. We learn from our mistakes. There is no need to punish for the mistake that person made when we have forgiveness in our hearts and we give them the space and ability to make amends and restore what was lost or wronged. Life’s challenges are easier to handle when we know we are not alone. Life is stressful, but if we have a few trusting relationships where we know that we are loved, valued, and understood, then we can work through the challenges together. Sometimes we need support, sometimes we are the one giving support. Either way, healing is not done in isolation. Healing happens in community, in relationships built on mutual respect, that encourage growth and strength. This one is straight forward. We all need people, we need community. All of the guidelines above can be practiced in relationships. We don't grow and learn and without others to support us. This can be one of the hardest truths for trauma survivors to accept. You may pride yourself on not needing anyone, I know I did for a long time. But I was wrong. I learned that it was okay to need others and that isolating yourself and not needing people isn't a sign of strength. It's fear. When we start reaching out for support, it is a sign of healing. I’m repeating the message because it is just THAT important. Community is VITAL to healing. I urge survivors to find a place, online or in person, where you are an important part of a group of people that understand you and your journey. A group where you know you matter so you can carry that truth in your heart and be grounded in that truth. All of these guidelines will be so useful to your healing as you grow and heal and restore from the trauma of your past. Healing is about learning, about keeping an open mind and an open heart as you step back into the amazing person you are, into the amazing life that you deserve. If you need further explanation on any of these points, or if one in particular inspired you to incorporate it into your healing right away, but you need some guidance to do it, remember that I do private coaching! You can book me hourly and schedule support as you need it moving forward. Click HERE to see my availability on my calendar and book a call with me! And if you are need of a community, a group of fellow survivors, you can join my online Facebook group, a private group where survivors work through their healing together every day using my year-long healing guide, Releasing Your Authentic Self. Click HERE to learn more about the group and join today!